Next Sunday afternoon, the Mariners are set to host the Los Angeles Angels. Shohei Ohtani, the 23-year-old known as the Japanese Babe Ruth, might pitch for the Angels that day (provided he doesn’t go on the disabled list after suffering a mild left ankle sprain Friday night). The Mariners should put Ichiro Suzuki in right field. Bat him leadoff. Give the 44-year-old Japanese legend a chance to face his nation’s newest phenom and his 100-mph fastball. 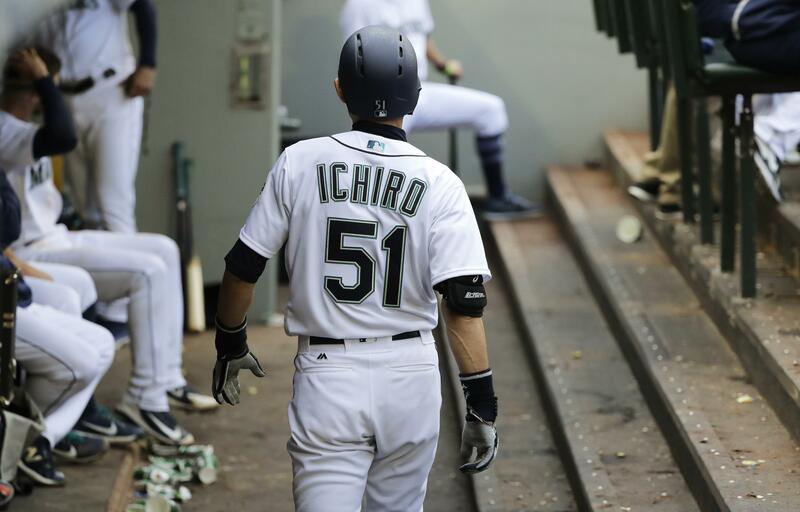 Let Seattle fans shower Ichiro with applause every time he steps to the plate or jogs to his position. And, in the middle of the seventh inning, skip “God Bless America” and “Take Me Out to the Ballgame” and invite the members of the 2001 Mariners team that Ichiro broke in with onto the field and hold a retirement ceremony. Ichiro earned both the American League MVP and Rookie of the Year awards that season as the Mariners won a major league record-tying 116 games. You’ve probably read a story or two about Ichiro in the past week, after the Mariners sent down a promising young player, Guillermo Heredia, and kept Suzuki, then hitting .212, on the roster. The Mariners agreed to a one-year deal with Ichiro in early March after left fielder Ben Gamel was injured. Was it a good public-relations move? Certainly. Ichiro received perhaps the loudest ovation when introduced on Opening Day at Safeco Field. He wowed fans by leaping at the outfield wall and taking a home run away from an opponent. He had two hits and walked twice the day Heredia was sent down, as if to prove he still belonged. And he scored the winning run the other night as a pinch-runner. But fans in the Pacific Northwest are no longer content with feel-good stories. Not with a club that has the longest current playoff drought among the four major professional sports and has never been to the World Series. And that’s why it’s time to say sayonara. The list of greatest trades in Mariners history isn’t a long one. Acquiring Randy Johnson for Mark Langston. Getting Jamie Moyer for Darren Bragg. And, of course, the deal made famous by the sitcom “Seinfeld,” Jay Buhner from the New York Yankees for Ken Phelps. The November 2016 trade of Taijuan Walker and Ketel Marte to the Arizona Diamondbacks for shortstop Jean Segura and right fielder Mitch Haniger isn’t threatening the top three yet, but give it some time. Entering the weekend, Haniger was batting .307 and ranked tied for second in the American League in RBIs (26), tied for third in home runs (9), fourth in slugging percentage (.682) and fifth in on-base plus slugging (1.064). Segura batted .300 last season and has seamlessly moved down to the No. 2 spot in the batting order to let speedy Dee Gordon lead off. Walker, a former first-round pick, has been no better than a .500 pitcher and recently underwent Tommy John surgery, ending his season. Marte is batting .224 for the Diamondbacks. The ninth inning always seems to be an adventure with Edwin Diaz on the mound. (Think Fernando Rodney). Remember the season opener against Cleveland? Diaz came in to protect a one-run lead and hit two batters with pitches, allowed two stolen bases to put the tying and go-ahead runs in scoring position and yet struck out the side to get the save. But his numbers are nearly off the charts. Diaz has an MLB-leading 11 saves in as many opportunities and opponents are batting .047 against him, the best mark by a reliever in the majors. He leads all A.L. relievers with 25 strikeouts, averaging 16.88 per nine innings. And he has a WHIP (walks plus hits innings pitched) of 0.68, allowing two hits and seven walks in 13 1/3 innings. After a day off Monday, the Mariners host the suddenly competitive Oakland Athletics for a three-game series and then go against the Angels, who just relinquished their lead atop the A.L. West to the defending World Series champion Houston Astros. The Mariners took two of three from the A’s two weeks ago at Safeco Field, the loss coming against left-hander Sean Manaea, who no-hit the Boston Red Sox in his next outing. The M’s will face the Angels – and possibly Ohtani – for the first time this season. Published: April 28, 2018, 3:06 p.m. Updated: April 28, 2018, 6:23 p.m.